For this Sode, you need nine 30cm (12") bamboo BBQ skewers. Also, you need to cut off six short 0.15SL (4.4cm, 1 3/4") lengths of skewer. The photos show how these are all glued together. Two pairs of skewers have the pointed ends raised up off the table, forming the upper and lower horizontal spars. The remaining skewers are just lined up straight, flat against the table top. This is the vertical spar. To make sure there is no kink at the joins, get your head down low and look along the skewers. Do a little shifting, if necessary, before the glue dries! Snip off the point from the glued group of four skewers. 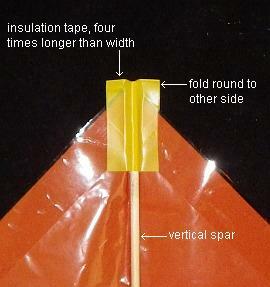 Line this end up with the top corner of the kite sail, with the skewers resting along the fold line of the plastic. 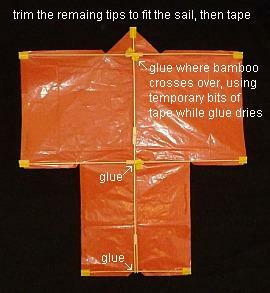 Attach the bamboo to the plastic with insulation tape, as in the photo. Now lay down the other pairs of skewers across the left and right corners of the sail, so the middle joins sit on the vertical spar. Tape the tips to the sail corners. These are the horizontal spars. 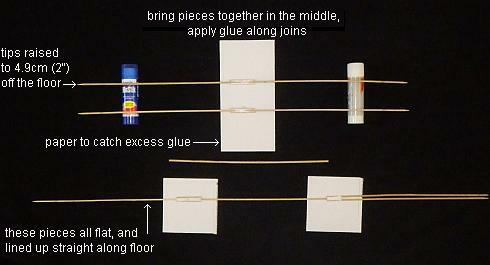 Finally, use a few drops of glue to attach the skewers together at the points where they cross each other. I used a few extra bits of tape to temporarily keep the joins in place until the glue dried. The photo shows the kite at this point. All glued and dried? Now all the tabs need to be folded and secured with clear sticky tape. Up there is a close-up photo showing one of the tabs. 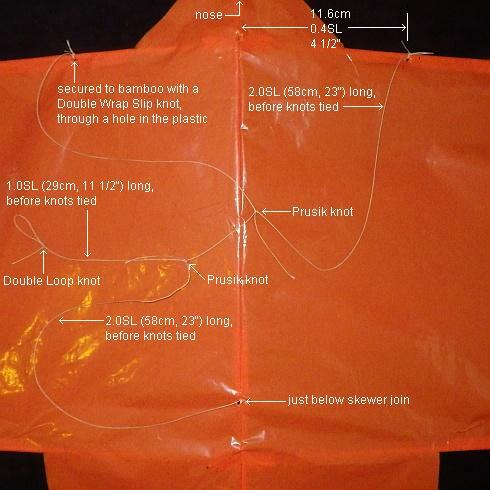 The kite is nearly complete, as you can see in the photo. I was a little more sparing with the tape on the upper horizontal spar tabs, to help avoid nose-heaviness. TIP: Secure the slip knots onto the bamboo of the spars with a tiny blob of wood glue each, so they can't loosen. Hold the short bridle line up so all the bridle lines are straight, with the kite laying flat on the table or floor. 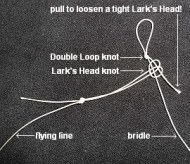 The Prusik knot nearest the sail should be shifted so it is centered - right over the vertical spar. Referring to the diagram below, shift the higher Prusik knot to the shown position. It's not necessarily the perfect position for your individual kite, but it should at least fly on the first attempt! Later, you can experiment with shifting the position slightly, just a little at a time to improve how high your kite flies. 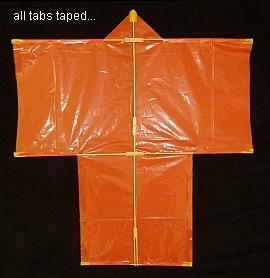 Cut out a long rectangular piece of dark plastic for the tail. Black garbage bag plastic contrasts nicely with the orange sail. Make it about 0.3SL (8.7cm, 3 1/2") wide and 6.0SL (174cm, 69") long. As you can see in the photo, the ends of the tail are knotted near the tips of the bottom horizontal spar. 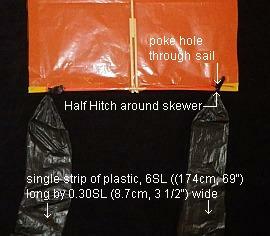 You will need to poke holes in the sail plastic, and then attach each end with a simple Half Hitch. At this point, you've finished making the 2-Skewer Sode!